The capital of the US state of Texas, the city of Austin is also the Live Music Capital of the World. As you go around the city, you will soon unearth other treasures and unique attractions (aside from the fantastic live music entertainment) that make Houston a true delight to explore at night. 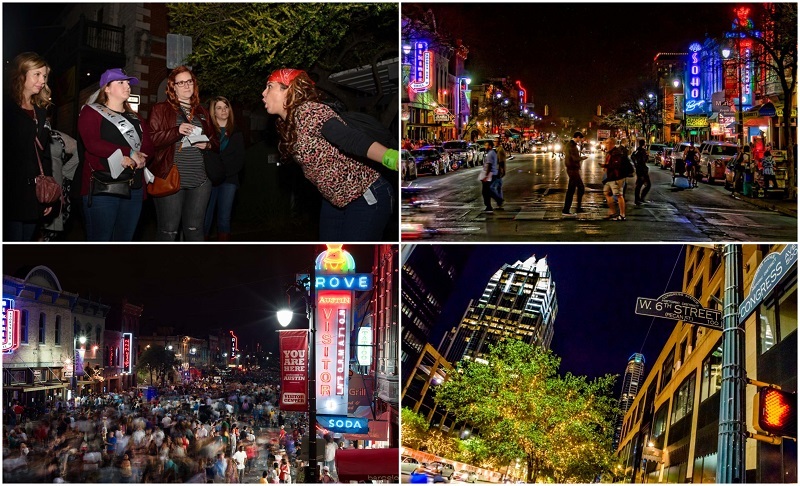 Here are our recommendations for the best fun things to do in Austin at night. Explore the natural nighttime beauty of Lake Travis, one of the most popular vacation destinations in Texas, on a luxury double-decker boat. The vessel leisurely glides on the water for a relaxing sightseeing experience. Gaze at majestic waterfront mansions, pass by Starnes Island as you make your way towards the Mansfield Dam, or view the Devil’s Cove. Lake Travis is home to an abundance of lakeside parks and watercraft options for those who would like to explore the area even more. The night boat cruise starts at 5 pm and lasts for 2 hours. Experience the beauty of Lake Travis at night on the Pedal Barge, Austin’s first cycleboat – a pontoon boat with 8 pedal stations, a motor, and a paddle wheel at the back. You are encouraged to wear comfortable shoes that can easily be used for pedalling, with the tour starting at the Austin 360 Bridge. Visit the lighthouse, view the bridge, and the scenic Bull Creek surroundings. The last stop is at County Line BBQ for an invigorating drink. Last cruise departure is at 9 pm, and goes for 2 hours. Visit the Austin Aquarium to see thousands of species of animals and riveting interactive exhibits – for kids and those who will always be young at heart. Get ready for a jaw-dropping underwater view of hundreds of cold and warm water fish. 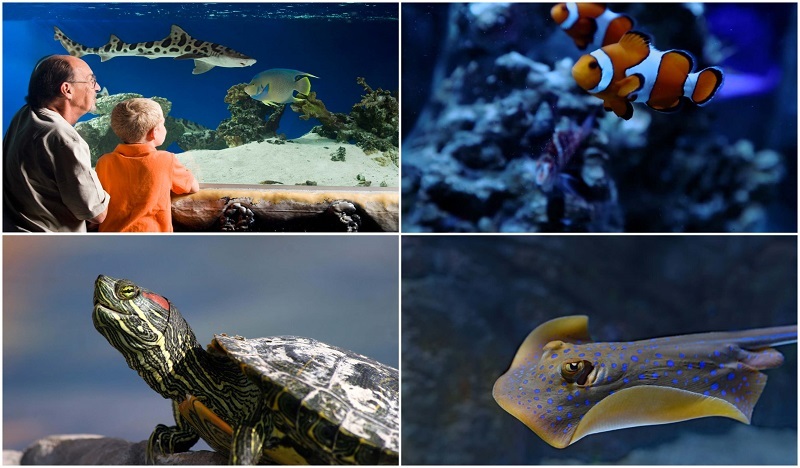 See a wide variety of amphibians and check out the stingray touch tank. Spend a fun time at the interactive lorikeet and parakeet aviary, or at the rainforest with hundreds of reptiles. The Austin Aquarium is open nightly until 8 pm. Head on to the iFLY Austin to experience the adrenaline rush of being able to fly – without actually jumping off an airplane! Indoor skydiving gives you the feeling of being in a true freefall inside a vertical wind tunnel, with a smooth column of air that makes it possible for you to fly. An instructor is on hand to give you a pre-flight training session and will also be present to guide you as you fly like a bird. Afterwards, you will be presented with a personalized flight certificate you can truly be proud of. The last arrival is at 10 pm, with the flight session lasting for 75 minutes. If you are looking for something out of the ordinary at night in Austin, you should visit the Museum of the Weird located on Sixth Street in the downtown area. The museum is at the back of the gift shop named Lucky Lizard Curios & Gifts, which was in turn named after the owners’ prized pet lizards. The museum showcases the owners’ odd collections, such as suits of armor, Fiji mermaids, shrunken heads, and a whole lot more of weird items that will pique your interest for the unusual. “America’s Strangest Attraction” is open daily until midnight. Austin is home to several haunted spots, making the city a preferred destination for those who want their vacation to be focused on the paranormal. A nighttime walking tour of some of the city’s most haunted locations will definitely be something to enjoy for the thrill-seeker in you! A walking ghost tour of the Congress Avenue Historic District includes tales of Austin’s haunted past, as told by a charming tour guide. Walk along historic buildings, trace the paths taken by serial killers, learn about hauntings in and around the city. A haunted Austin tour will not be complete without a visit to the celebrated Driskill Hotel, where reports state that two different brides committed suicide in the same room, 20 years apart. Tours begin at 8 pm for 1.5 hours. Glide through the most scenic and popular spots in Austin on a segway for a unique city experience at night. The tour starts with a basic segway training, then on to a picturesque spot overlooking the most beautiful parkland in the city. Head on to Dough Hill Summit where you will see the sun reflected on the city’s landscape. Just in time for the setting of the sun, you will cross the Ladybird Lake and make a stop on the Congress Avenue bridge. Your knowledgeable tour will then guide you through Rainey St., so you can have a feel of the Austin nightlife. Tour starts at 5 pm and goes for2 hours. Go for an invigorating bike tour at night that will take you through most of the east side of downtown Austin. The tour includes a quick stop at a local brewery for a beer, before heading on to the selected local spots of interest. Two other breweries (with free beer!) are included in the tour, along with the Texas State Capitol, Texas State Cemetery, and other tourist attractions in downtown. The tour begins at 6 pm, and lasts for approximately 3 hours. 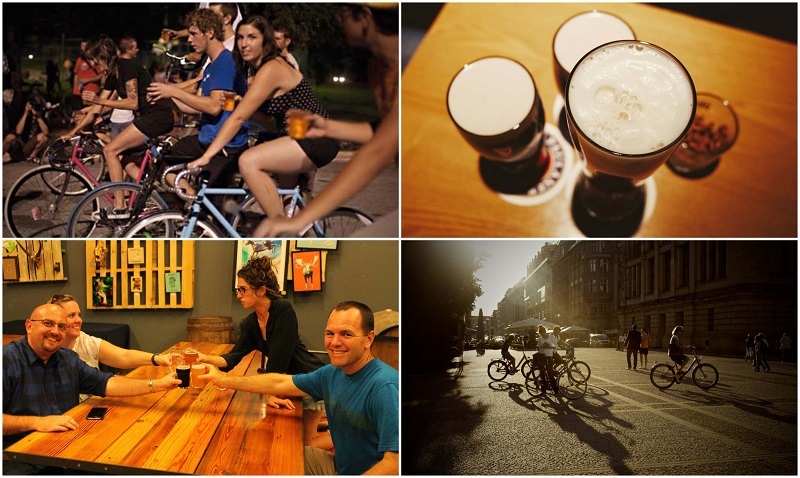 Are you planning a night of bar-hopping in Austin? The best way to go around the city is in an open-aired private shuttle with enough space for you & your friends. The rental includes your very own driver, who will drive you to wherever you wish to be at any time covered by the rental hours. You will not have to worry about assigning a designated driver for the evening. With a professional driver at your beck and call, you and your friends can all have fun without worrying about your safety on the way back to your hotel. The knowledgeable driver can even give you recommendations about the hippest places you can check out! View the magical splendor of the city at night, from high above inside a helicopter. 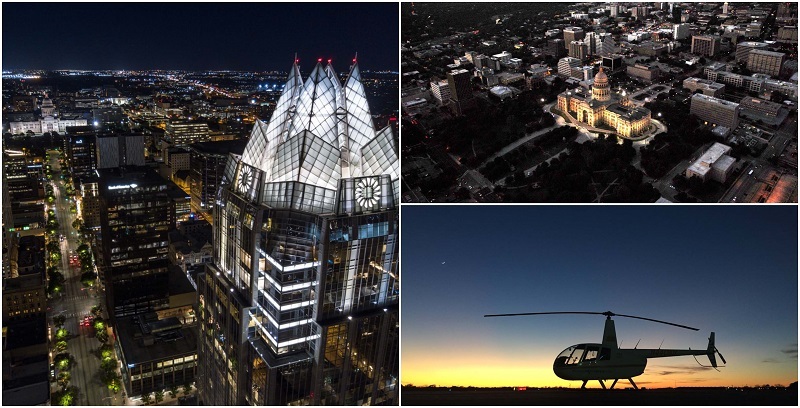 For 30 minutes, you will soar above the most scenic and popular spots in Austin, including the downtown area, Penny Backer Bridge, Mt. Bonnell, Lake Travis, the Oasis on the Lake, Texas State Capitol, the 360 Bridge, and a lot more. This is truly a memorable way to spend your evening in Austin! Helicopter tours are available Wednesdays to Sundays until 8 pm. You are requested to arrive 30 minutes prior to the flight time for the safety briefing and check-in procedure. This one-of-a-kind murder mystery tour is created specifically for Austin with the help of a NYC theater company. Expect to have a heart-pumping experience as you do your investigation on the streets, guided by instructions from the first location. You will have to interview possible murder suspects and look for clues to find out what happened with the murder of an Austin socialite. Prepare your detective skills for this activity! This tour begins at 7 pm and goes for 2 hours. Learn more about Austin’s underground graffiti scene with this graffiti tour with a painting class included. Comfortable shoes are recommended for this tour, which begins at the social hub of the street art scene – SprATX. You will then explore the murals and quirky shops in East Austin, which is the unofficial art district. At the HOPE Outdoor Gallery, you can try your hand at spray painting; the place has more than 40 abandoned walls just waiting to be filled with unique artwork. This tour starts at 5 pm on Fridays & Saturdays and lasts for 2.5 hours. Scavenger hunts offer an exciting hunt with the chance to explore the city by foot at nighttime. Austin Cluetivity games start with a meeting at a starting location in the city for an orientation. An iPad will be provided to teams with up to 6 players. Each iPad will be loaded with a map, which the players will use to navigate to GPS points. Once the group is within range of an iPad crystal, a box has to be tapped to start the game. The themes of the games range from puzzle solving, deciphering a riddle, or involving an augmented reality item. All tasks should be completed within a set time limit for a team to win. Scavenger hunt games are between 20 to 90 minutes. 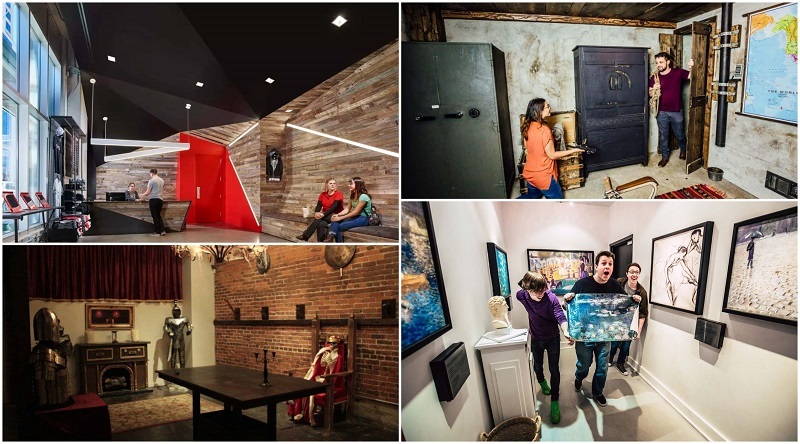 Escape rooms allow you to be a part of an alternate reality, where you have only an hour to complete a mission to escape from being locked up. Some of the themes in the evenings include Gold Rush, Prison Break, Playground, Classified and The Heist. These exciting games encourage teamwork, determination, and quick thinking to be able to deal with a mission successfully – so you can finally escape the confines of a locked room! Depending on the game, the last one starts at 11:55 pm, lasting for 60 minutes. Get to see where the largest urban bat colony in the world is located with this engrossing bat watching tour. Tour around the city on a bike, beginning with a spin around the Lady Bird Lake. You will also pass by Barton Springs, Butler Park, Pfluger Bridge, Zilker Park, and the boardwalk. Your guide will then lead you to the Congress Avenue Bridge, where at the perfect time you will see the bats flying out from under the bridge. Truly, this is a remarkable sight that shouldn’t be missed in Austin at night! The tour starts at 6:30 pm and goes for 2.5 hours. The Austin food scene is dominated by barbecue, Tex-Mex cuisine, and an abundance of diverse cuisines thanks to the thriving food truck businesses. This is where you will get to try – most likely for the first time – unknown food items which will sumptuously tickle your taste buds as you do your exploration at night. Here a couple of Austin food tours you could consider in the evening. This tour combines beer + barbecue along with a tour of some of the city’s most popular tourists’ spots. Get ready with a healthy appetite, as you sample the best of local beers partnered with the best Austin BBQ offerings. Prepare for a food tour like no other, as you check out the best of Austin’s best local cuisine. Join an expert guide as he leads you to the best food trucks, and most celebrated restaurants and dining places in the city. This family-friendly tour will leave you with happily-satisfied palates & tummies! Rainey Street used to be just quiet residential street in Austin. It has long since been transformed into one of the most unique and popular entertainment districts in the city. Most of the quaint bungalow structures have been slightly remodelled to now house bars and restaurants, where you can spend the night with friends & families during the evenings. 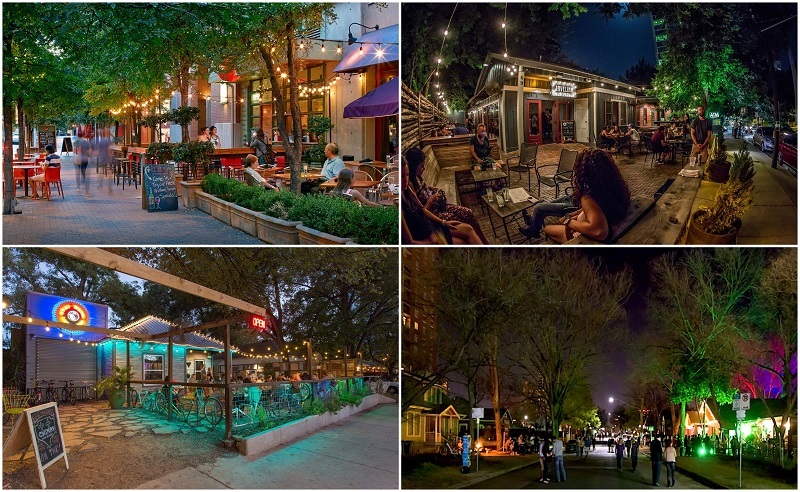 One of the best ways to experience Rainey Street is through a walking tour, which combines puzzles, augmented reality, and questions that need to be answered to locate physical clues. The tour starts at 7 pm, for 2 hours. With more than 50 breweries, Austin is the place to go to if you want to explore more than your usual branded beers. 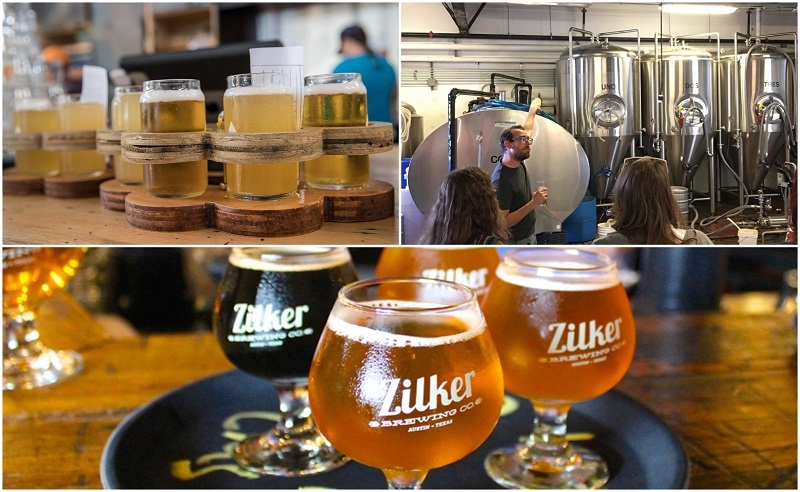 Experience the dynamic Austin craft beer scene with this evening tour, which includes a stop at three of the city’s top breweries and craft beer establishments. Get the chance to sample more than 10 different microbrews, with your informative guide giving you the history of each place. This beer tour’s last departure is at 8 pm, and runs for 3 hours. The picturesque town of Marble Falls is on a chain of seven gorgeous lakes and is home to several local wineries. On this tour, you will visit the Flat Creek Estate Winery & Vineyard in the evening to enjoy an exquisite 3-course dinner menu perfectly paired with Flat Creek wines. 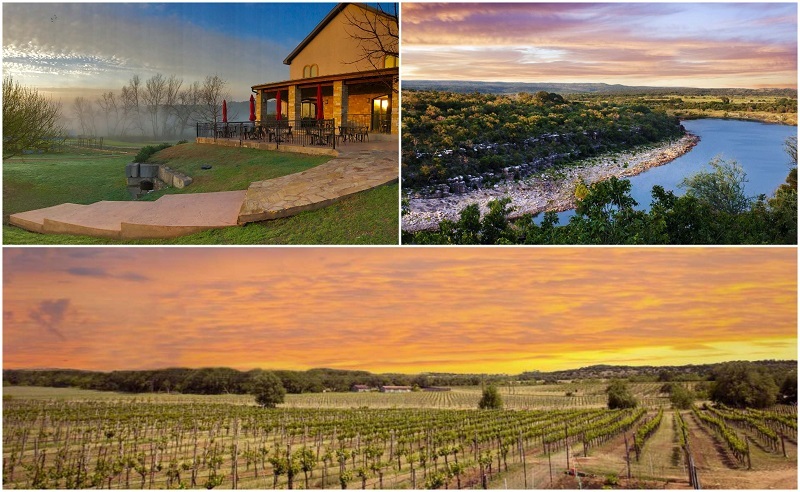 Before the dinner, you can explore the vineyards to enjoy the scenic Hill Country views. You will also tour the 10,000-case production of the winery. The night tour begins at 5 pm. 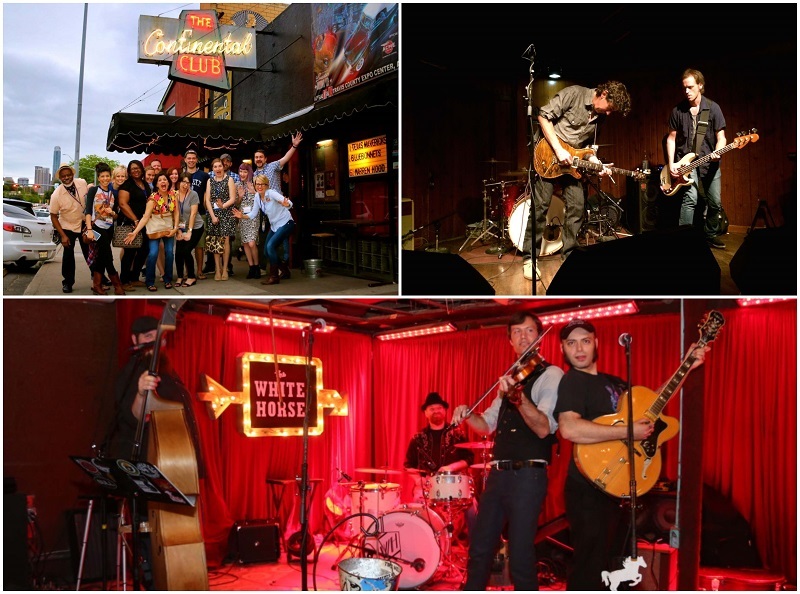 Austin is the Live Music Capital of the World, and you can expect nothing but the best when it comes to live music entertainment options in this city especially at nighttime. As the city has over 250 live music venues, this live music crawl has been created to lead you to only the top locations. You will learn about the city and its history of live music, see iconic music venues, check out new clubs, and get the inside scoop – from your local musician guide – on the local music scene. The last live music tour begins at 8 pm. Austin is a bustling city that shows more of its dynamic energy at night. You can choose to spend your evenings in Houston indoors sampling the best of live music, beers and cuisines, or exploring the tourist attractions on foot. Regardless of your choice, you will most likely be left with the desire to keep coming back to this city for more unforgettable evening experiences.